• How long can the NutriVent probe remain in its seat? For a maximum of 30 days. • What kind of transducers are used for the registration of the gastric and esophageal pressures? They are normal invasive pressure transducers, generally used in the wards. Sidam can supply a model (subject to being informed of the monitor type used in the ward). • For the verification of the proper positioning of the probe, is a radiography compulsory? A radiography is the instrument being the ultimate method for the positioning verification, but the waveforms visible on the monitor can provide excellent indications (see operating instructions). • Is there a correlation between vesical pressure and gastric pressure for measuring IAP? Yes, on this matter see the probe validation article (download section). • Must the balloons be inflated with air or with water? • Can the balloons make the introduction of the probe more difficult? No, they can’t. The balloons are made of a very thin material. 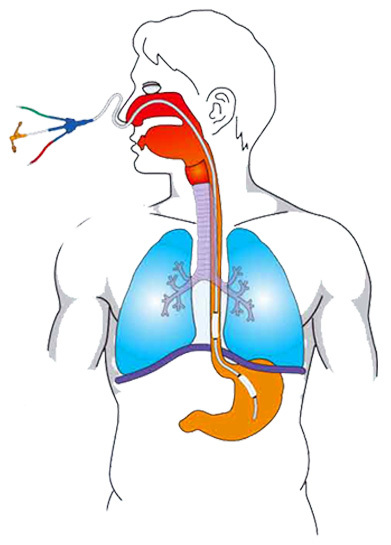 When passing into the nasal/tracheal cavity they inflate and adhere to the catheter without impairing sliding. • At which height must the pressure transducers be positioned? It does not matter the height, at which the transducers are placed; they must not be moved once they have been positioned. • The introduction guide is a little hard in the extraction; are there any special tips for the extraction? Yes, there are. A good lubrication before the introduction is important, then it is advisable to rotate the guide while is being extracted. Next, at least for about the first 20 cm, proceed very slowly. • Is there a pediatric version of the NutriVent? At the time being, no version is available.